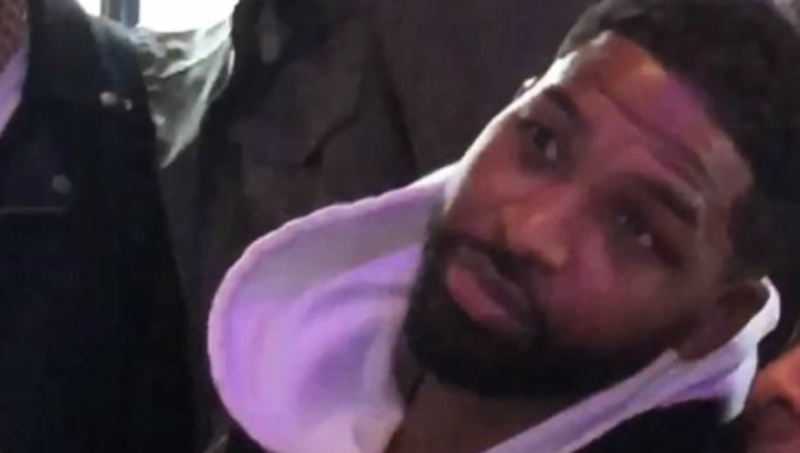 Although Khloé Kardashian and boyfriend Tristan Thompson have been staying in Cleveland getting ready for the birth of their baby girl, the NBA star spent the past weekend in New York City ahead of his game against the New York Knicks last night. And it appears Tristan was up to no good during his time away from pregnant Khloé. He was spotted on April 7 at the PD-D lounge in NYC, and footage shows him getting very close to a mystery brunette. Although his hood is in the way, they definitely appear to be making out! Thanks to the ​Daily Mail, videos have been leaked showing the events that took place. ​​Okay, so it definitely seems like this hooded person is kissing someone. But how do we know it's Tristan under there? Other photos were leaked of him wearing the same outfit! Other videos from the night show Tristan talking with friends and dancing to music at PH-D's Sunset Saturdays event. It was a night off for the Cleveland Cavaliers, who played in Pennsylvania the previous night against the Philadelphia 76ers. Khloé has been posting on her app and website ​frequently on how excited she and Tristan are for the arrival for their baby girl, which makes this even more upsetting. We really, really hope this scandal isn't true, but the videos beg to differ.